Jeeps is hungry. She unfurls a slender red arm and slides up the smooth acrylic wall of her tank at the Port Townsend Marine Science Center (PTMSC) in search of her daily snack. Jeeps (short for GPO or Giant Pacific Octopus) is one of many marine animals we nurture at the center in order to generate awareness of marine life conservation in our local Salish Sea. Did you know Jeeps and her species can learn to distinguish shapes and patterns and solve mazes? They have individual personalities and show emotions by changing their colors. Jeeps is curious and likes to interact with children, often stirring from her den and flashing from bright red to mottled white when students come to visit. She is even learning to open a jar lid to get her food- check out this video of the first time she did it. You can help the PTMSC support the continued care and public education for beautiful marine animals such as Jeeps by participating in the Seattle Foundations' GiveBig campaign on May 15th. It's easy and it's fun! Whatever amount you give toward our goal of $10,000 is "stretched" by the Seattle Foundation, meaning they'll add to the amount you contribute. 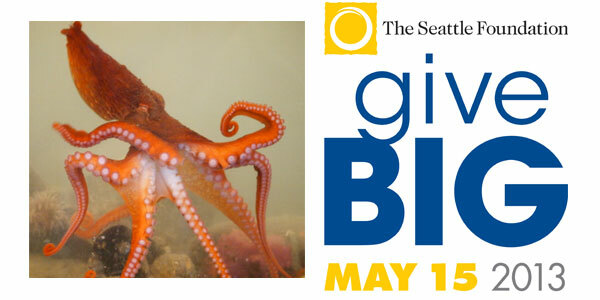 Look for more behind-the-scenes photos and videos of our much-loved marine animals on Facebook leading up to the GiveBig day on May 15th, and follow us on Twitter. Stay tuned for more information about this exciting way to extend your donation in support of marine animals through GiveBig.